This salad is perfect for Rosh Hashanah (or any other time). It is light and refreshing with a delightful crunch from the apples and snap peas. Since it’ s traditional to avoid nuts on Rosh Hashanah, you can use sunflower seeds instead. At other times, though, I prefer the pecans. Whisk together the lime juice, mint leaves, Dijon mustard, sugar, garlic powder and salt. Slowly whisk in the olive oil until emulsified. Slice the apples as thinly as possible (use a mandolin for best results) with the peel on. Immediately add the apple slices to the dressing to avoid browning. 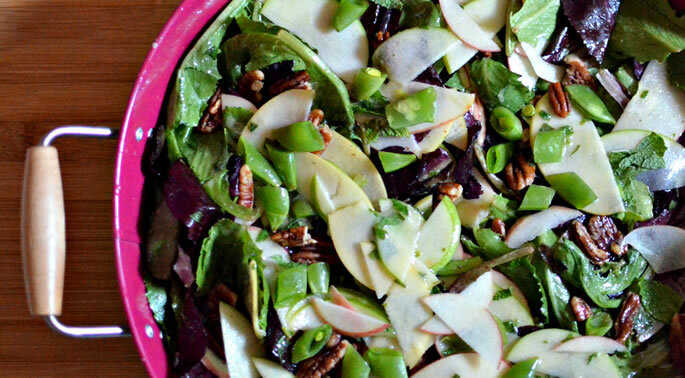 Toss the apples with the mixed greens and sugar snap peas. Top with pecans or sunflower seeds. Serve immediately.